There’s been some pretty awful news in the world lately, so I think it’s appropriate to take a moment to consider something that will help restore some faith in humankind. 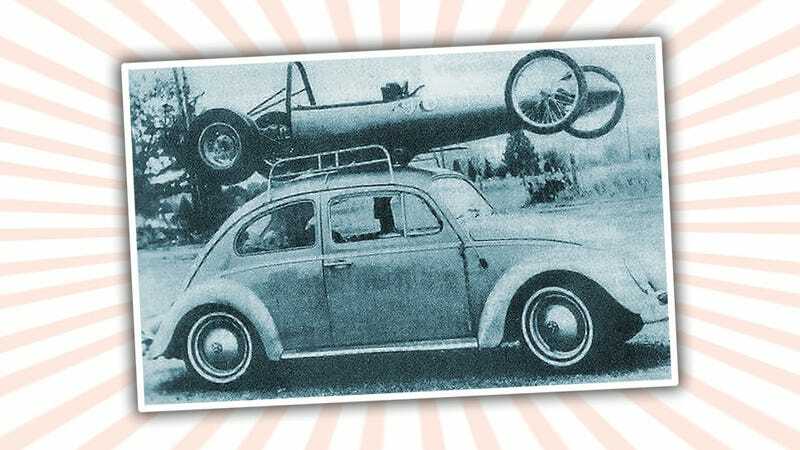 For that purpose, I submit this picture, from the late ‘60s, of Gene Berg’s Little But Quick dragster and his transporter Beetle. Gene Berg is something of a legend in the VW performance community, where his name is now most associated with a performance-parts company for aircooled VWs. Back in the day, though, Gene Berg was a VW performance innovator, coming up with new performance parts like dual-port heads long before the VW factory, and even making entire VW-powered race cars and dragsters. That picture shows one of those cars, the Little But Quick, a 490lb little screamer that ran the quarter mile in just over 11 seconds at over 120 MPH. Even better, in that picture up there, there’s only one engine. The story is Berg would use the engine in his transporter Beetle to get to the race. At the track, he’d swap the motor into the dragster, race, and then install it back in the Beetle to get home. That’s how you keep a dragster light enough to fit on a standard VW roof rack. And, I’m assuming, it could be removed by however many guys he had in the car with him? Supposedly, that engine was based on a ‘59 40HP Bus engine block, with custom manifolds, Porsche carbs, and special pistons in Corvair cylinders to give it almost 1900cc. Anyway, just knowing that makes everything in that old, grainy picture fantastic, and I wanted to share it with you.